Europe dominates play at the Weber Cup as it reaches the penultimate phase. Captain Dominic Barrett who is currently world number two opened the singles with a powerhouse performance hitting a 278 against team America’s Wes Mallot. Two hander Jesper Svensson then bowled a 264 against fellow two hander Kyle Troup. The young Swede followed up with a colossus set of scorecards, hitting 278 and 245. 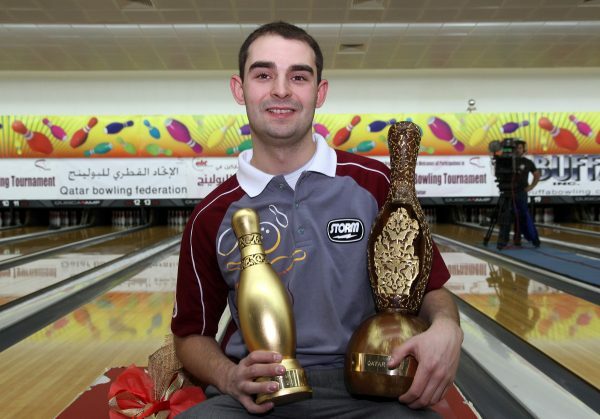 He also featured in the doubles match, which Europe won convincingly by 44 pins with a 256. America’s most experienced bowler Parker Bohn III pulled one back for the USA against Martin Larsen. Larsen last night bowled the highest game of the weekend with a 289. Scoring in Manchester has been altered so that a strike counts for 30, while spares count for ten plus the total number of pins from the first bowl. In addition, there is only one chance for strike or spare on the final frame. The charismatic Stuart Williams has also been a class act bowling a 278 and 266 game to accompany an unfortunate sudden death blow and defeat in the doubles. Although the Americans’ have fought hard to keep in touching distance of Europe, with the score at 6-1 after day one, the damage has proven costly. Yet the spirit from both teams has been of the highest order, and the fans have been instrumental. It has not been a complete whitewash, as Wes Mallot barely missed the pocket in his first single’s match, and in the latest round up, met Dominic Barrett again to lose by just two pins. Europe still are sending out clear messages to their Weber Cup opponents that one open frame may as a result hand themselves in defeat. The Europeans’ are on top form coming into the final day.